]Our dojo has been open since 1981 and undergone a rich and dynamic development through decades. Académie Saïdo is steadily evolving within modern times while preserving its deep original roots. Académie Saïdo distinctive features are the high quality of teaching provided to students and its friendly atmosphere. Teaching is multi-pronged and includes karate (offensive & defensive techniques, dodging & sparring techniques, etc. 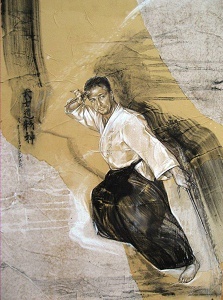 ), aïkido (self-defence techniques based on joint control and supported roll and fall), kobudo (various traditional weapons like nunchakus, bôs, jôs, tonfas, shinaïs, and saïs), as well as kendo and iaïdo (for higher levels). Straightforward and friendly relationships between students are based on respect and good spirit. That’s why the dojo remains a welcoming place for newcomers as well as for long-lasting students. Académie Saïdo founder, Kancho Della-Cioppa, has been practicing martial arts since he was a child. He has been teaching since 1983. His traditional training and broad education are enriched by knowledge he acquired over time in various related subject areas (e.g. shiatsu). Today, his thrust is directed to blending and integrating into his teaching new components of wisdom drawn from biomechanics and nutrition.